Diana Hopkins, “Diana Hopkins,” Histories of the National Mall, accessed April 22, 2019, http://mallhistory.org/items/show/91. Diana lived with her father and stepmother at the White House from 1940-1943, when her father, Harry Hopkins, served as a close adviser to President Franklin D. Roosevelt. Diana participated in the Easter Egg Roll each year that she lived in the White House. In 1943, Diana, at the age of 11, was given permission to plant a Victory Garden on the South Lawn of the White House grounds. Victory Gardens were small vegetable gardens grown by families to supplement the food rations they received during World War II. Diana Hopkins was the daughter of Harry L. Hopkins and Barbara Duncan. Her mother died when she was five years old. Harry Hopkins had worked with Franklin D. Roosevelt since 1931, when Mr. Roosevelt was Governor of New York State. In 1938, when Diana was 6, her father was appointed Secretary of Commerce by then President Roosevelt. Diana became a frequent visitor to the White House and spent significant time with Eleanor Roosevelt. When the Queen of England came to visit in 1939, Mrs. Roosevelt told Her Majesty that Diana expected to see a queen wearing a crown and scepter, and the Queen agreed to let Diana meet her just before the formal banquet. Eventually Hopkins resigned his position as Secretary of Commerce due to health issues, and in 1940, he became special advisor to the President. 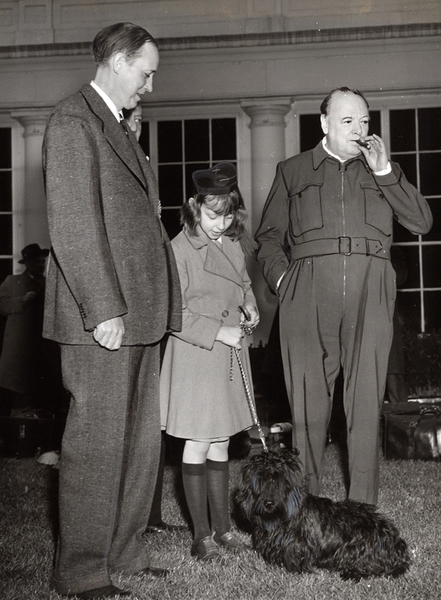 The Hopkins family moved into the White House, where they lived until the end of 1943. While there, Diana got to enjoy the White House pool with Mrs. Roosevelt, participate in the annual Easter Egg Roll, and plant a Victory Garden. She was even allowed to invite friends over to play on the White House grounds. "My Day: Eleanor Roosevelt Chronicles Life and Work in the White House," White House Historical Association.